Lostprophets and Bring Me The Horizon are to headline the UK leg of the legendary music festival, coming to Alexandra Palace on 10th November. Also playing are 3OH!3, A Loss For Words, A Skylit Drive, Architects, AWOLNATION, Blood On The Dance Floor, Bowling For Soup, Breathe Carolina, Bury Tomorrow, Crossfaith, Dead Sara, Family Force 5, Less Than Jake, Man Overboard, Me Vs Hero, Middle Finger Salute, New Found Glory, The Acacia Strain, The Story So Far and Yashin. More bands will be announced over four stages and the festival will play host to a skate show and a huge merch market. All of the fun of the US Warped, under one roof to keep you warm and dry! Tickets are on sale now from this link. 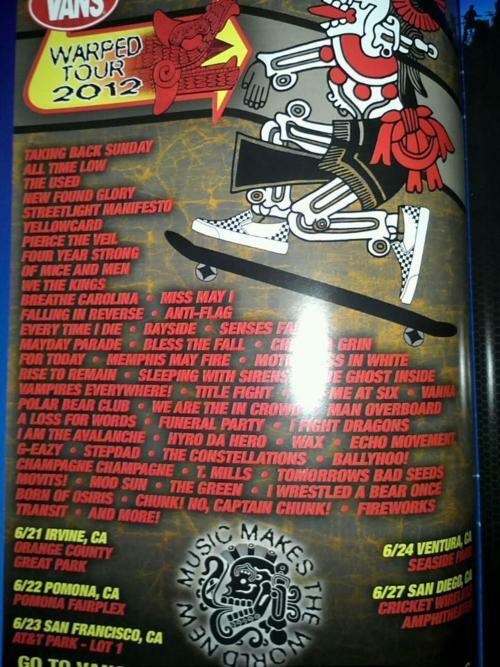 VANS WARPED TOUR 2012 LEAKED LINE UP?! A seemingly legitimate Vans Warped Tour poster for the California dates has made its way on to the internet and lists All Time Low, Taking Back Sunday and New Found Glory amongst its headliners. While no official word has been given on the leak, many of the yet-to-be-announced bands on it have self-confirmed for the tour. Check out the leak here! In the meantime, why not check out the official announcements at CtrlAltRock’s dedicated Vans Warped Tour page? Punk rock summer camp is baaaaaaaack! Storming its way through just about every city in the USA, Vans Warped Tour 2012 is the biggest ever year for what is now a rite of passage for most music fans. Tickets go on sale for each of the dates on March 30th, but you can register for pre-sale tickets here. In the mean time, check out the bands already announced for the tour below – every Wednesday, we’ll add more!